The catalogue includes a large number of online Creative Writing courses, covering the Novel, the Memoir, Creative Nonfiction, Travel Writing, Poetry and more. For the professional, the program offers online business courses in subjects like Fundamentals of Project Management, Value Investing: An Introduction, How to Build Successful Startups: Learn Lessons Straight from Silicon Valley Entrepreneurs and Leadership by Design: Using Design Thinking to Transform Companies and Careers. And there's a growing number of online Liberal Arts courses too. Take for example The Geology and Wines of California and France, Drawing Inspiration: Developing a Creative Practice, and The Daily Photograph: Developing Your Creative Intuition. If you live in the San Francisco Bay Area, check out the larger catalogue. 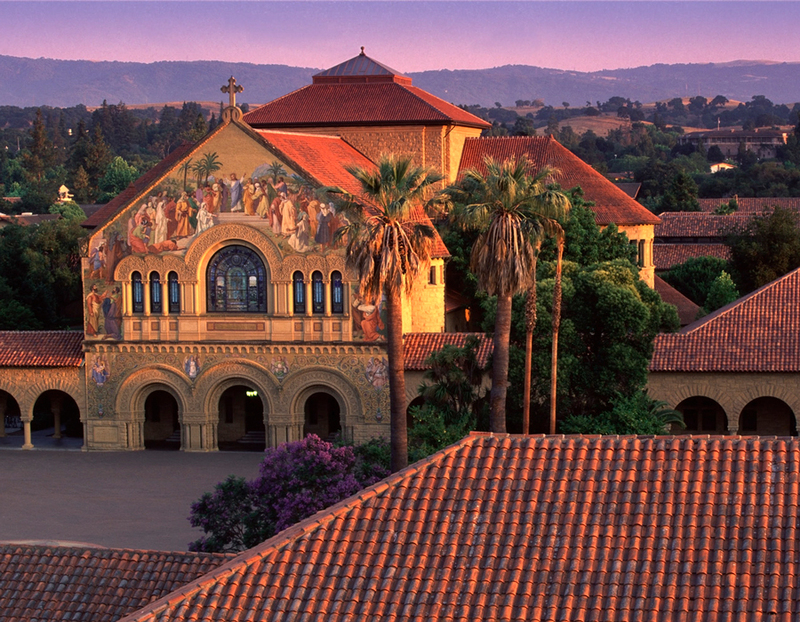 Stanford Continuing Studies has 150 courses getting started this Winter quarter (next week), many taking place in Stanford's classrooms. The two flagship courses of the quarter include: Pivotal Moments That Shaped the Modern World and The Ethics of Technological Disruption: A Conversation with Silicon Valley Leaders and Beyond. The catalogue includes a large number of online Creative Writing courses, covering the Novel, the Memoir, Creative Nonfiction, Travel Writing, Poetry and more. For the professional, the program offers online business courses in subjects like An Introduction to Project Management, How to Build Successful Startups: Learn Lessons Straight from Silicon Valley Entrepreneurs, Value Investing: An Introduction, and Leadership by Design: Using Design Thinking to Transform Companies and Careers. And there's a growing number of online Liberal Arts courses too. Take for example Leo Tolstoy's War and Peace, The History of Wine, Greek Mythology and Drawing Inspiration: Developing a Creative Practice. If you live in the San Francisco Bay Area, check out the larger catalogue. Stanford Continuing Studies has 130+ courses getting started this Summer quarter (next week), many taking place in Stanford's classrooms. For anyone living outside of California, check out the program's list of online courses here. Long before humanity had paper to write on, we had papyrus. Made of the pith of the wetland plant Cyperus papyrus and first used in ancient Egypt, it made for quite a step up in terms of convenience from, say, the stone tablet. And not only could you write on it, you could rewrite on it. In that sense it was less the paper of its day than the first-generation video tape: given the expense of the stuff, it often made sense to erase the content already written on a piece of papyrus in order to record something more timely. But you couldn't completely obliterate the previous layers of text, a fact that has long held out promise to scholars of ancient history looking to expand their field of primary sources. The decidedly non-ancient solution: particle accelerators. 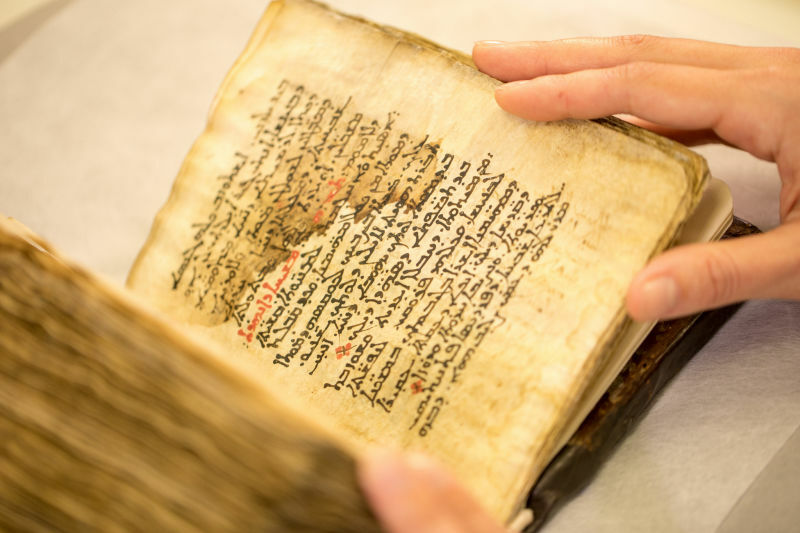 Researchers at the Stanford Synchrotron Radiation Lightsource (SSRL) recently used one to find the hidden text in what's now called the Syriac Galen Palimpsest. 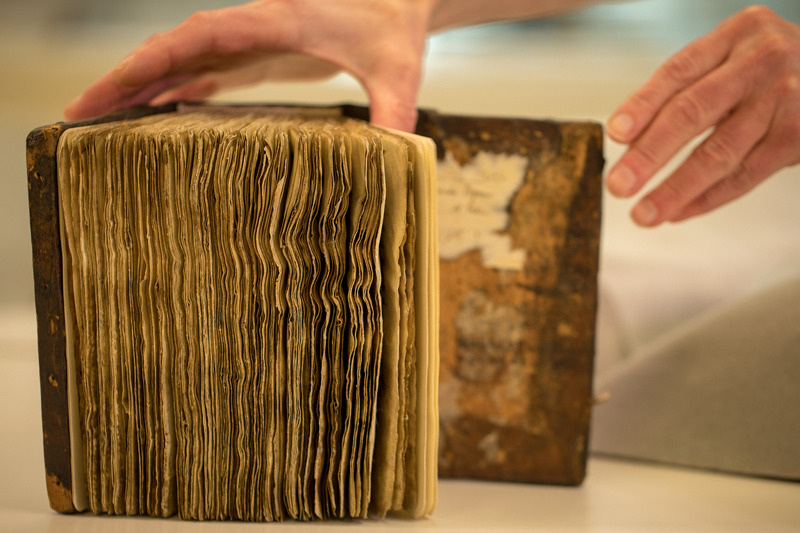 It contains, somewhere deep in its pages, “On the Mixtures and Powers of Simple Drugs,” an "important pharmaceutical text that would help educate fellow Greek-Roman doctors," writes Amanda Solliday at the SLAC National Accelerator Laboratory. Originally composed by Galen of Pergamon, "an influential physician and a philosopher of early Western medicine," the work made its way into the 6th-century Islamic world through a translation into a language between Greek and Arabic called Syriac. Alas, "despite the physician’s fame, the most complete surviving version of the translated manuscript was erased and written over with hymns in the 11th century – a common practice at the time." Palimpsest, the word coined to describe such texts written, erased, and written over on pre-paper materials like papyrus and parchment, has long since had a place in the lexicon as a metaphor for anything long-historied, multi-layered, and fully understandable only with effort. The Stanford team's effort involved a technique called X-ray fluorescence (XRF), whose rays "knock out electrons close to the nuclei of metal atoms, and these holes are filled with outer electrons resulting in characteristic X-ray fluorescence that can be picked up by a sensitive detector." Those rays "penetrate through layers of text and calcium, and the hidden Galen text and the newer religious text fluoresce in slightly different ways because their inks contain different combinations of metals such as iron, zinc, mercury and copper." Each of the leather-bound book's 26 pages takes ten hours to scan, and the enormous amounts of new data collected will presumably occupy a variety of experts on the ancient world — on the Greek and Islamic civilizations, on their languages, on their medicine — for much longer thereafter. But you do have to wonder: what kind of unimaginably advanced technology will our descendants a millennium and a half years from now be using to read all of the stuff we thought we'd erased?